"When I arrived to songwriting weekend, I had one thing in mind: compose a song that would be accessible for a congregation, would promote solid theology, and would portray a message in a way that hasn't been done before. In the world of modern Christian music, there are not many songs that have been written about how the Holy Spirit brings people to faith through the preaching of the Gospel. 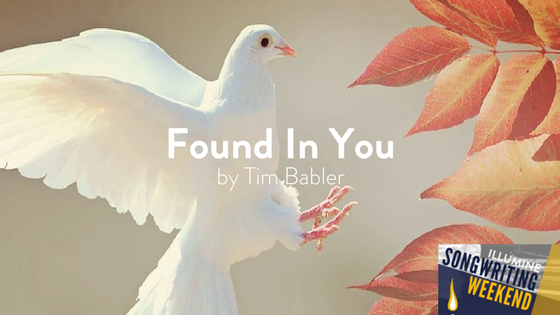 Tim does an excellent job highlighting several of the functions of the Holy Spirit. The first verse describes how we are convicted through the Spirit’s work in our hearts. The second shows how we are set free from the power of sin through faith in Christ, given to us by the Spirit. The chorus uses several metaphors to show how now that we can be found in the Spirit, we are transformed, we are found, we are free. Finally, the bridge reminds us that the Spirit enables and empowers us to live a sanctified life out of thanks for all that God has done for us. What I love about Tim’s songs are that they are always easy to learn. The rhythms in this song are simple, but effective; making it easy for a congregation to pick up quickly. I do have one suggestion if using it in a congregational setting. While the key of G is very easy to play in, it leads to the melody hanging on a D for several notes in a row. While this is certainly attainable by most congregations, it might be more comfortable if taken down a step or two.